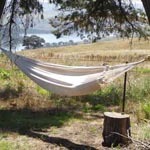 The twist in the tale – or should that be tail? Remember that ‘clunk’ I heard on the top of a sand dune back in the Simpson? Well, I know what it was. I also learned (again – maybe I don’t learn), not to take anything for granted. Something about counting chickens? From Eulo I headed down to Cobar for a couple of days with family. Then, finally, it was the last leg home. I spoke to Doc the night before “see you tomorrow night for dinner.” I said. I got up early, said goodbye, and headed off. I’d gone 100k – not even as far as Nyngan which is the next town – when suddenly that ‘clunk’ became ‘bang, crash, bang’. 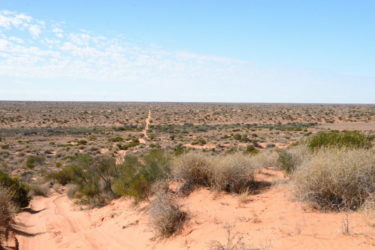 I knew exactly where that was coming from – the very place I was always scared would break in the desert. The tailshaft. When I’m away I follow Doc’s advice to check everything on the car every day. This time the tailshaft became a particular focus. The car gets quite a workout over those sand dunes, and I knew that the tailshaft was something I wouldn’t be able to fix. Every day I got down underneath the car and made sure everything was still on tight and still connected. After I head the ‘clunk’ it got a closer going over. It looked ok to me, but it seems I didn’t know everything to look for. I pulled over to the side of the road and got out. It was cold. Bitterly cold. The sun wasn’t even completely up yet. I pulled out a torch and looked under the car. And couldn’t find the tail shaft at all. So I looked again. Yep, the tailshaft was there. But it was no longer connected to the gear box. 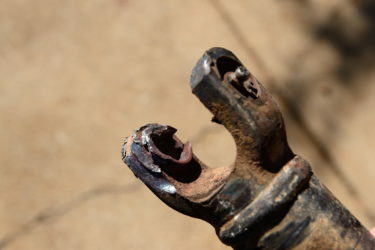 The universal joint was gone completely. And that’s when I lost it. Even though it was only 7.30 on a Saturday morning I rang Doc. “I’ve just f*cked my car.” I cried. And I do mean cried. All that pent up emotion – fear, excitement, and probably a bit more fear – came out. “Can you come and get me.” So he did. 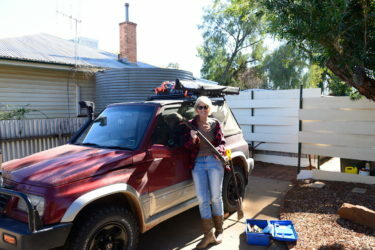 He went and got the car trailer from his mate, and headed up to Cobar, a 9 hour drive away, to pick me up. Reassurance! 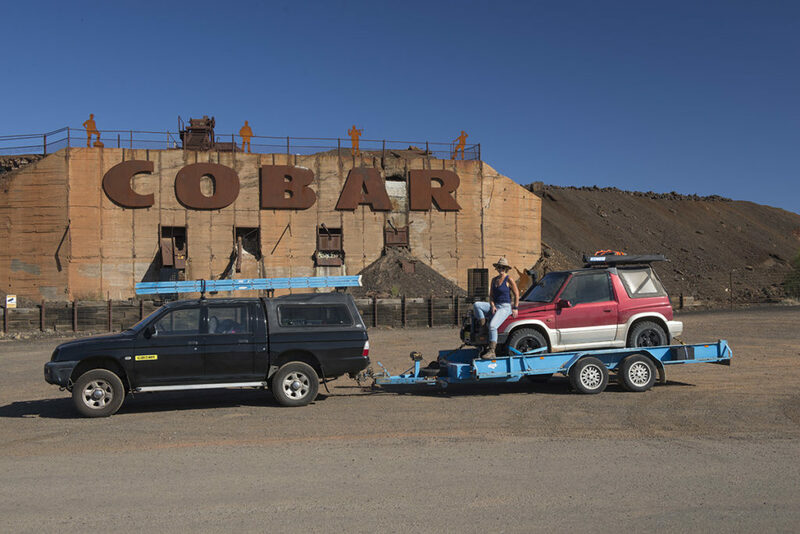 Then I rang Cobar to get a tow back. Thankfully I was close to Nyngan. A bit further away and I might not have had any mobile reception. Or maybe that would have been better. If I have to handle something on my own I generally do. It’s no use falling apart if there’s nobody to help you out. Quick as a flash I diagnosed the problem. “It’s your head gasket.” Obviously, having spent an afternoon at the workshop with my head under the bonnet of my car, I’m now a fully qualified mechanic. It was late by the time Doc arrived. Too late to look at my car. So after breakfast next morning we went to check it out. “You did a good job of that.” He said. No use doing anything by halves! He took the tail shaft off so he could drive the car onto the car trailer. He got into the car, put it into 4WD, let the clutch out, and … nothing. The car didn’t move. “That’s odd.” he said and got out to have a look. “When did that happen?” he asked, looking behind the front wheel. “Hmm” he said while watching it. Below is from the video I showed Doc. Taken on the morning of day 3 of my trip through the desert. Before I got to the bigger, steeper dunes. See if you can see what he was watching. 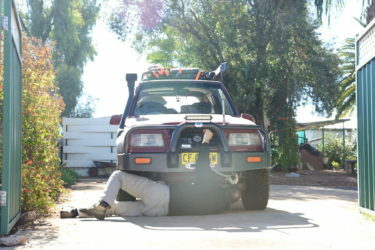 The CV joint had given way and 4WD wasn’t locking in. No wonder I was having trouble on those dunes!! In stereotypically female fashion, I had been blaming myself for having problems. I knew the car should be making it a lot more easily than it was, but I thought I just didn’t have the skills to know what I was doing. After all, it’s only a poor workman who blames their tools. But in this case, it was the tools. Many years ago, before I did any 4WDing, possibly even before I got a licence, I went away with my boyfriend and a few other people. One of the blokes in our party took a detour offroad, and somehow his car got stuck in 4WD. I remember all the boys talking about it, and laughing because he had to drive hundreds of kilometres home at around 20k because it was stuck in low range. I didn’t really know what they were talking about then, but the story kept coming back to me while I was in the desert. I kept thinking I’d rather get stuck in low range for the whole 2,000k trip home than stuck in 2WD in the desert. In 2WD I wouldn’t be able to do the dunes at all, I thought. So it’s probably just as well I didn’t know while I was in the desert or I might not have made it out. Sometimes it really is better not to know. 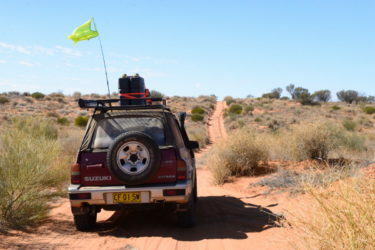 But now – I JUST DROVE THE SIMPSON DESERT IN 2WD. How many people can say that!?!?!? !